The Arc-Flash Relay AF0500 delivers a flexible design and unrestricted scalability making it ideal for retrofits in electrical equipment. In addition, the AF0500 offers: Savings of 90% over installation of arc-resistant switchgear, two internal trip paths for added reliability and tie breaker and zone tripping capabilities; one relay has the ability to trip two separate zones. The AF0500 is a microprocessor-based arc-flash protection relay that limits arc-fault damage by detecting the light from an arc flash and rapidly tripping the feeder breaker. The unit is well suited for switchgear, transformer, motor controls center and power converter applications. Sensors, inputs, and connections are health monitored to ensure fail-safe operation. A secondary solid-state trip circuit provides a redundant trip path. A USB port is used for configuration and access to event logs. 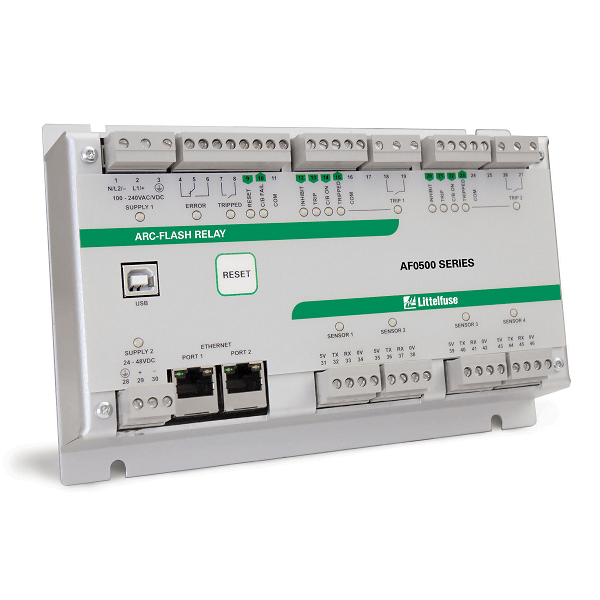 The AF0500 arc-flash protection relay includes an Ethernet interface and supports Modbus TCP communication. Zone tripping, upstream breaker tripping and tie breaker tripping applications can be easily configured. A number of control inputs allows interconnection of multiple AF0500 units to form a system.